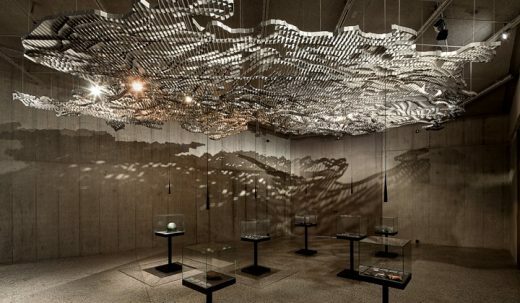 On 31 July 2016, the evening before the Swiss National Holiday, the National Museum is opening its new permanent exhibition “Archaeology Switzerland”, designed by ATELIER BRÜCKNER. It is located in the new building by architects Christ & Gantenbein, which sculpturally complements the horseshoe-shaped old museum building and makes a continuous and uninterrupted visitor viewing route possible. 500 square metres of exhibition floor space in the shape of lightning lie between the existing cultural-history presentations of the Swiss National Museum. New means of gaining access to the past are thus created – and not only for Swiss people. ATELIER BRÜCKNER has arranged more than 1,300 artefacts of Helvetian archaeology to form three highly expressive, thematically dedicated settings: Homo, Natura and Terra. The variegated exhibits, including the Roman gravestone dating back to 180 A.D. on which the name Zurich is mentioned for the very first time, assert themselves in front of powerful architecture composed of grey fair-faced concrete. The heart of the exhibition is the Homo area, which offers a chronological overview of the museum’s different collections: 100,000 years of human history – from the Palaeolithic to the Middle Ages. In each case, around 200 exhibits are placed together to form six narrative portrayals of different epochs, whereby the selection and arrangement of the exhibits in each portrayal represent and refer to a specific period of time. Reaching up to the ceiling, they are shown against the longer walls of the space and illustrate a changing culture: from the first few stone tools strewn about like a herd of animals, to exhibits that are set out like a Roman street grid, and the power centres of the Middle Ages, which express themselves in a circular arrangement of exhibits. With the help of a movable scanner, visitors can call up detailed information on each object, for example on one of the oldest cartwheels in Europe, which is visually made whole once again with the help of media. It dates from the Neolithic. Taken out of this chronological presentation and placed at the centre of the long room, there are seven absolute highlights of the museum collection, including a finely ornamented bâton percé made of reindeer antlers with the oldest representational images of Switzerland (13,000 B.C. ), a bowl made of pure gold, punchmarked with heavenly bodies and animals (1100 B.C. ), and the famous treasure of Erstfeld, consisting of valuable neck rings and bracelets dating from around 390 B.C. Film scenes projected onto the rear wall of the showcases tell the stories of the exhibited objects as well as stories of the people to whom they once belonged and the people who found them. One protagonist, for example, is a Celt who dedicates his hoard of gold to the gods and buries it in the ground before starting off on his journey over the Gotthard. When a visitor touches the showcase, this window into the past opens interactively. The showcases containing the highlights are connected by a floor strip. It stretches through the entire space and invokes general human concepts such as honour, passion, shelter and grief. The museum visitor is able to integrate himself here by taking a seat in a slightly elevated position inside the last showcase. An audio replay of the text “I in the Silicon Age” of the Swiss philosopher Stefan Zweifel serves as an encouragement to reflect on time and the past. The adjacent space entitled Natura draws the attention to the interrelationships of natural history and the archaeological exhibits. 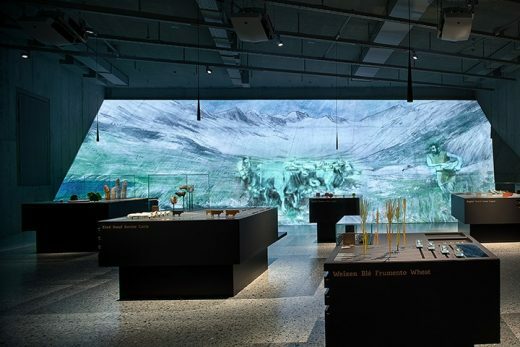 An animated drawing, projected onto a large surface on a monumental, oblique wall, brings the Swiss landscape directly into the museum. 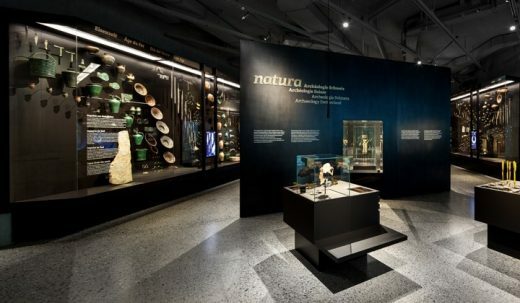 At seven theme-based stations, the museum visitor can research plant, animal and mineral finds, thus triggering additional scenes in the projection. Up to seven animated illustrations are possible at the same time. They show the influence of people on nature as well as the interaction of environment and humankind. For example, the horn of a wild aurochs, a primary exhibit of a thematically assigned unit, is linked to a scene that shows oxen being used to plough the first fields. Finally, the relationship between exhibit and archaeological site is shown by the space opposite. Entitled Terra, it can be understood as a means of gaining access to the exhibition both spatially and in terms of content. After all, an exploration of the past always begins with an investigation of the archaeological landscape. The fascination of the items in the context of where they were found is expressed here scenographically. The visitor strolls below the Swiss landscape, an orographic rib-type model hovering in space. Depending on the standpoint, this gleaming aluminium sculpture, which consists of 3,000 individual parts, appears compact when closed or light-filled when open. Geographically striking archaeological sites are linked to visually enhanced archaeological treasures by means of suspended light elements. Underneath is a small wicker basket from a village of houses on stilts once situated next to Lake Zurich (1100 – 800 B.C. ; site altitude: 406 metres above sea level) and a stone tool made of rock crystal (around 6500 B.C. ), which was discovered in a cave 1494 metres above sea level in the canton of Uri. A choreography of light that replicates the changes in the course of a day introduces movement into the exhibition. Moving shadows wander over and past the floor, walls and visitors, poetically elucidating the ongoing passage of time.